When you first contact our office to make an appointment, you will initially be booked onto one of our pre-care classes. These are held twice a week, a Tuesday Morning & Wednesday Evening. These are a vital start to your Chiropractic Care. They are complimentary and you are encouraged to bring a spouse or family member with you. At the class we explain what Chiropractic is, how it can help you and how it differs from other types of treatment, both medical & non-medical. It lasts around 30-40 minutes. When you come in for your Private Consultation, you will be greeted by our Chiropractic Office Assistant Lucia or our Office Manager Ciara. We will take care of you, guiding you through to our consultation room and going over our intake form. You’ll read through our consent, and we’ll take a through medical history and details of any current complaint or health challenges. 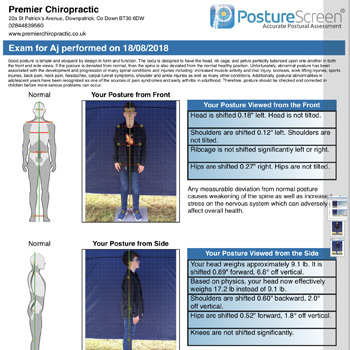 Once this form is complete, we will ask you to get into a gown so that Dr Brian McElroy (Doctor of Chiropractic) has access to your spine for the both the scans and chiropractic examination. Our Chiropractic Assistants will take you through a variety of different spinal, muscle and postural scans. These together give Dr McElroy (Doctor of Chiropractic) an overall picture of your overall health and wellbeing, as well as your individual symptoms. It’s important to note that the scans measure your posture, the muscle activity along your spine, your range of motion, the thermal temperature of your glands and organs and your heart rate variability — an extremely good indicator of overall stress levels. The CoreScore Scanner is one of only a handful in Ireland, and Dr McElroy (Doctor of Chiropractic) consistently invests in the latest technology to provide the best results for his patients. Dr McElroy (Doctor of Chiropractic) will come in and introduce himself. He will then proceed to ask how the quality of your life is affected by any health challenges you are facing. (Since aches and pains will come and go, it is essential that we understand which aspects of your life are being affected.) We believe this to be very important so that we understand what your expectations are. The chiropractor then performs a thorough chiropractic and orthopaedic examination, testing muscular and neurological function through a variety of methods. If you use glasses, please bring them along for the consultation as there are some health history details to be filled out. Are you a good candidate for chiropractic care? Arrange a time to discuss your health issues in person.